Dashboard in OS X Yosemite offers a way-cool set of widgets, Apple’s name for the mini-applications that live inside the Dashboard layer. You see, Dashboard takes over your screen when you invoke it by opening it (it’s in the Applications folder) or pressing its keyboard shortcut: F12 (or Fn+F12). 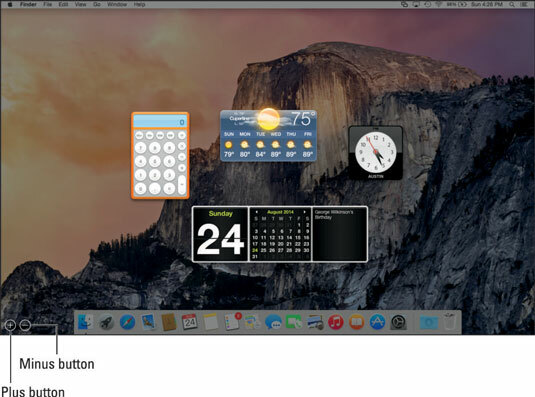 Here, Dashboard is shown with just a few of its default widgets: Calculator, Weather, World Clock, and Calendar. Plus Widgets are small, single-function applications that work only within Dashboard. Some widgets, such as Contacts and Calendar, talk to applications on your hard drive. 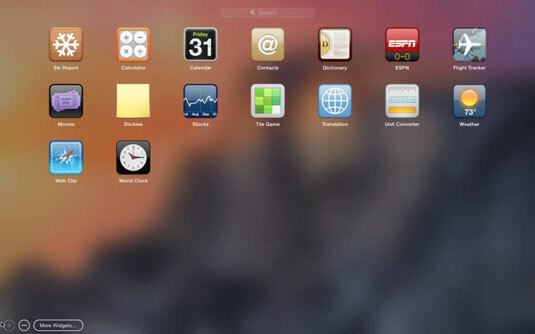 Other widgets — such as Flight Tracker, Stocks, Movies, and Weather — gather information for you via the Internet. Each time you invoke Dashboard, widgets that were open the last time you used it will be on your screen. To close an open widget, click the minus sign in a circle in the lower-left corner of the screen and then click the encircled X in the top-left corner of the widget you want to close. Alternatively, you can press the Option key and hover over a widget to reveal its encircled X; click the X to close the widget. To configure most widgets, move your cursor over the bottom-right corner of a widget and click the little i that appears (as it does with the Weather widget). The widget then flips around so you can see its backside, where the configuration options reside. For example, the Weather widget gives you choices that include your City, State, or Zip Code, Fahrenheit or Celsius, and whether to include lows in the six-day forecast, and the Clock widget allows you to choose your region and city. When you finish configuring a widget, click the Done button, which is usually (but not always) in the bottom-right corner; doing so flips the widget around again. Not all widgets can be configured. For example, the Calendar and Calculator widgets have no options to configure. If a little i doesn’t appear when you hover over the bottom-right corner of a widget with your cursor (or hover while pressing the Option key), that widget has no options to configure. To move a widget around on your screen, click almost anywhere on the widget and then drag it to the appropriate location. To access widgets other than the four on your screen by default, click the Open button (the large encircled plus sign shown earlier in the bottom-left corner) to open the Widget Selection Screen, which displays your currently available widgets. Widget Selection Screen may sound like a mouthful, but its former moniker, The Widget Bar, made it sound like some trendy watering hole downtown. To add a widget from the Widget Selection Screen to your Dashboard, click the widget on the Widget Selection Screen. To download additional widgets, click the More Widgets (at the bottom of the Widget Selection Screen) to launch your web browser and show you additional widgets you can download from the Apple website. To close the Widget Selection Screen, click anywhere on the gray background or click the Open button again. To uninstall a third-party widget that you no longer want, merely open the Widget Selection Screen and click the red minus sign next to its name. Your Mac politely asks whether you want to move this widget to the trash. You do. Finally, to close your Dashboard (if you’re not displaying widgets as overlays), press the same key you pressed to open Dashboard (F12 or fn+F12), press the Esc key, or click the encircled arrow at the bottom-right corner of the screen. Think of your Dashboard widgets as being handy-yet-potent mini-programs available at any time with a keystroke or click.